HCMAOE mini desk fan with strong airflow on the highest option! Apart from that, even the degree of rotation of the blades of the fan is controlled up to 90 degrees to ensure comfortable cooling. 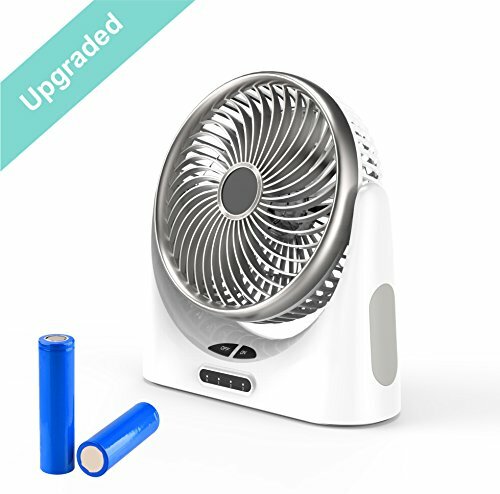 The brushless motor and efficient circuitry mechanism, this small quiet fan has a very strong wind with 3 speeds choice is what makes it outstanding. The fan runs on extremely low sound and can be used even in a quiet environment. It can be used when you are studying, sleeping and doing other such activities that require silence. You can use the regular USB cable to power up the fan. In addition, a cellphone adapter can be used to charge the battery of the fan. Powerful 4000mAh Battery has the power bank function, you can use the USB port charge your electronic device, such like iPhone/ iPad/ Samsung. High Quality Motor: Completely bronze brushless motor, 3 noiseless fan blades. Side and internal LED light would be a big bonus for lighting. 0 to 90 Degree Rotation: You can adjust the degree of rotation for the fan from 0 to 90 degrees to ensure that the entire area is getting sufficient amount of fresh air. This vertical rotation design allows the cool breeze blow to your face directly. Multiple Power Supply Choice: The fan comes with multiple power supply options. You can power it either via a USB cable or via batteries that come with the fan. The multiple power supply options make it extremely convenient for both indoor and outdoor use. Strong Wind: The maximal fan rotating speed arrives to 3200rpm. More airflow with no vibration when working and less noise. 4000mAh Rechargeable 18650 Battery (INCLUDED): The desk fan runs on 4000mAh large capacity rechargeable battery (installed). 3H-13H working time depend on different speed. The desk fan has USB port can be charge for electronic device (iPhone, iPad, Samsung), it makes the desk fan extremely suitable even for outdoor travel. If you have any questions about this product by HCMAOE, contact us by completing and submitting the form below. If you are looking for a specif part number, please include it with your message.